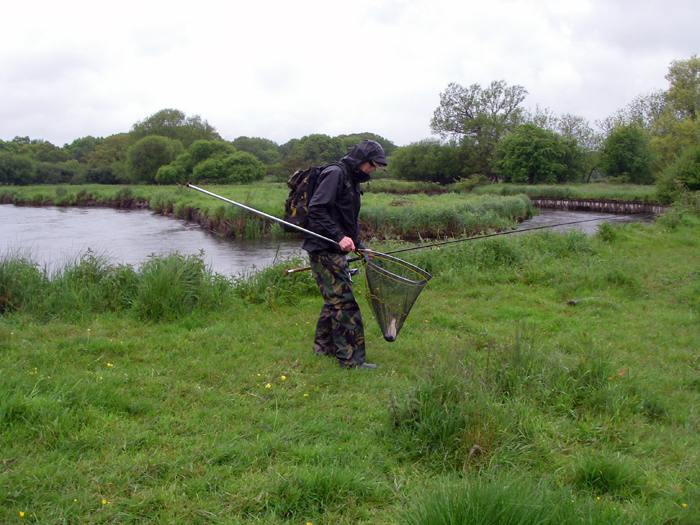 For some time I'd been wanting my pal Paul ( a keen all-round angler) to come down for a dabble in my local river. Anyway last week he emailed to say that he had a couple of spare days and we decided to give it a go. We chose the second of his free days because it was more convenient and that was our first mistake. For the previous week the weather had been pretty good with not much rain but - sod's law was in operation and the night before our trip the heavens opened. Undaunted, Paul arrived right on cue the following morning although it was still raining. We were going to get wet and the river conditions were far from ideal. The basic idea was for my pal to try and catch a seatrout, so he opted to spin. After my previous session when I saw lots of thinlips feeding in the shallows I'd decided to try something a bit different. 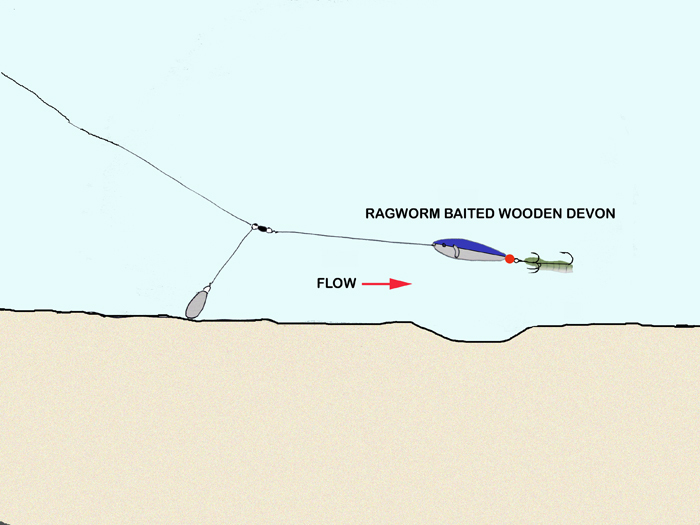 I didn't think that normal 'mullet spinning' tactics would be very effective in the very shallow, fast flowing water so, after giving the matter a bit of thought, I decided to try a ragworm baited, home-made wooden Devon minnow. Now I've used these lures for salmon for many years and by rigging them behind a small weight on a dropper it's possible to hold them in the flow while they spin nicely in the current. The idea was to use this tactic to present a baited 'spinner' to the mullet in a fixed position. Anyway, I tied a small Aberdeen hook on a short length of nylon behind the treble hook of the lure and baited it up with a section of worm. Paul set off in search of his seatrout and I went straight to a shallow gravel run where I'd seen mullet feeding last week. After the rain and in the gloomy conditions it was almost too murky to see anything but I lobbed the rig out into position and waited, and waited and waited. Was that a tap or just a bit of drifting weed? I couldn't be sure but it felt 'fishy'. Try again and half-an-hour later the same thing happened. For certain it wasn't a deadly technique but they could have been bites. 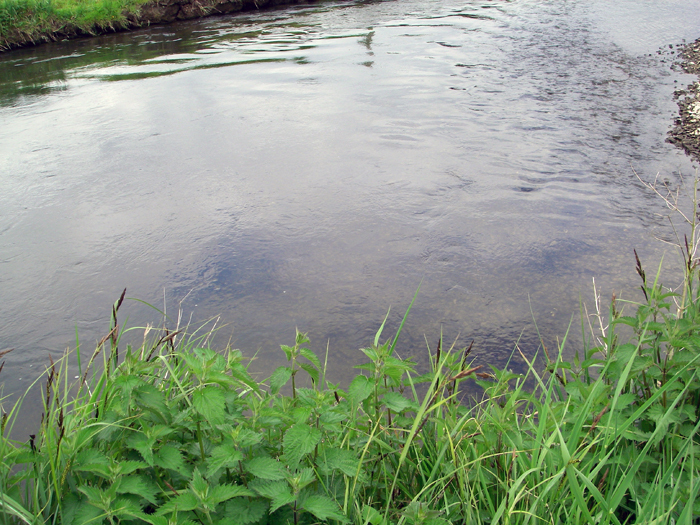 I shifted to another swim where the water was a bit shallower to have another go. At least Paul wasn't getting anything by spinning so I didn't feel that I was missing out. Again, after quite a long wait I had another knock. This time I felt pretty sure that it was a fish but was it a thinlip (there are pike, perch, trout and salmon in the river)? Out went the gear again and now, at last, the sun came out briefly. 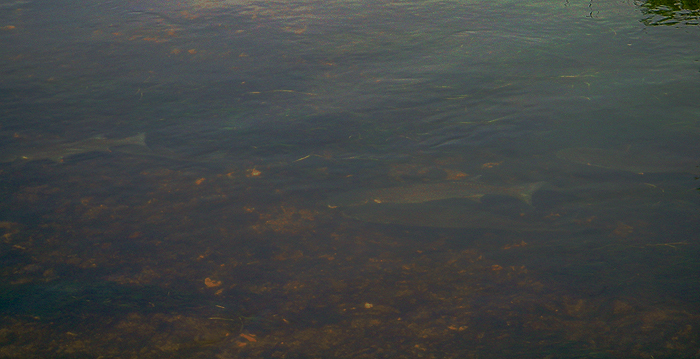 In the improved light I could actually see that there were mullet in the swim. I held my breath as they cruised up past my spinning lure then, suddenly one of the smaller fish took the worm and almost as quickly twisted off the hook. That, as they say, was that. Despite fishing on I never managed to tempt another mullet with the baited Devon. However, it was encouraging and I'll give it another go as soon as I get the chance - hopefully in clearer conditions so I can see what's happening. Oh! I almost forgot - what about Paul? 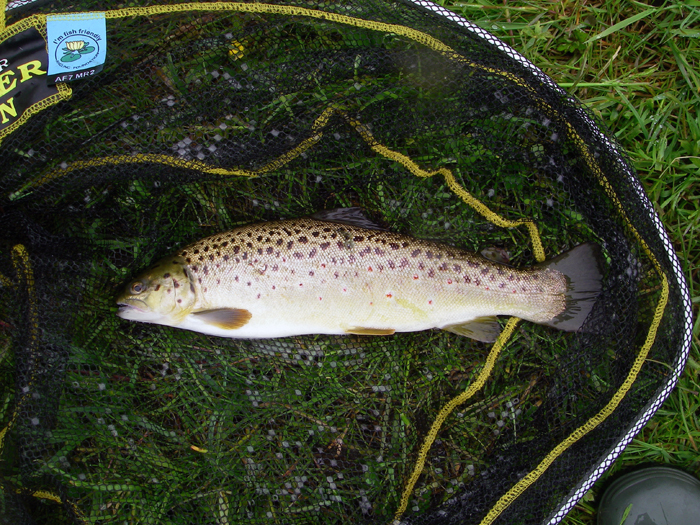 Well he flogged away hard for the entire session and finally managed to catch two brownies. There were to be no seatrout or mullet on that day although we both had a thorough soaking and enjoyed plenty of fishing talk. No doubt he'll give it another go later in the season and maybe by then I'll have perfected the rag baited Devon method.